iOS 6 is coming soon(ish) to an iPhone and iPad near you. But how does Apple's latest and greatest compare to the latest and greatest out of the Android camp, a.k.a. Ice Cream Sandwich. Gladiators, step forth! For the record, this is not a review. There will be no review until we have spent some quality time with the final version of iOS 6. This is a look at how these two stack up on paper in 10 key categories. 650,000 apps. 225,000 for iPad. That's one ginormous ecosystem. Android is currently at 450,000 apps for Android. While most of those will work on tablets, the number of apps that have been specifically optimized for Android tablets pales in comparison to iOS. Apple finally has its own Maps, which is a move that surprised no one, since Apple has been buying up mapping companies for years, and because Apple and Google aren't exactly getting along smashingly. From what we can tell, it's an elegant solution, with plenty of overlayed information, traffic updates, and yes, finally, turn-by-turn directions (narrated by Siri). It also has a 3D flyover mode (with vector-based graphics) which looks great, but it raises a question: Since none of the iPhones have 4G LTE radios, would 3D maps even be practical when you aren't firmly tethered to Wi-Fi? This, however, may be a non-issue, as 4G iPhones will likely be out in time for iOS 6 to drop. Big notable omissions: transit directions, bike directions, walking directions, and Street View. Google Maps is the gold standard (sorry, Bing, you ain't there yet). You can chose maps or satellite, crazy 3D buildings are coming, along with offline access, and Yelp-like locations/reviews are basically baked in. The banner feature has been turn-by-turn directions, which it's had since Android 2.0. For regular directions, you can choose driving, biking, walking, or public transportation. They've also mapped the insides of museums, malls, and expo centers. And, of course, there's Street View, which lets you actually see the place you're going—like, what it really looks like. 3D flyovers are cool and all, but the eye-level view may ultimately be much more useful. New in iOS 6, your browser tabs can be synced between all of your devices. In other words, the tab you open in Safari on your desktop will be easier to open on your iPhone or iPad. It's a pretty handy feature. Bookmarks are synced as well (which isn't new). The problem? Nobody uses Safari. With Chrome (beta) for Ice Cream Sandwich you get that same thing (tabs, bookmarks, search terms, etc.) synced between Chrome and your desktop. The only difference: people actually use Chrome. Like, the most people. So, yeah. Twitter got nicely integrated into iOS 5, but what about Zuck's little project? iOS 6 will have Facebook more deeply tied into the framework. You'll be able to upload photos directly from the phone's photo gallery. "Like" apps right from the App Store, and see which your friends "Like." Apple will be opening up the Facebook API so 3rd party apps can take advantage of this, too. Sharing has been one of Android's tentpoles pretty much from the beginning. Facebook is deeply integrated into Ice Cream Sandwich. You can share pretty much anything to Facebook from pretty much anywhere in the OS, through Android's little share icon (which you can use to share through a zillion other apps, and doesn't require additional work from app developers). You can choose to sync Facebook info either from people whose contacts you already have on your phone, or you can pull all of your Facebook friends into your phone contacts (but seriously, why would you do such a thing?). Sharing is still easier on Android, hands-down. Some people might go as far to say that Siri in iOS 5 was Apple's broken promise. It worked okay, most of the time, but not as well as everyone expected. Siri has been greatly improved, with new capabilities on movies, sports scores, and restaurant info. Also, Siri will now be available for iPad owners, opening the door for even more people to talk at slabs of glass. Another big improvement is support for Siri from a number of auto makers. The amount of hype around Android's Voice Actions pales in comparison to that around Siri, but that seems to be a PR problem more than anything else. Not only has it been around longer than Siri, it outgunned Siri in the majority of our tests. 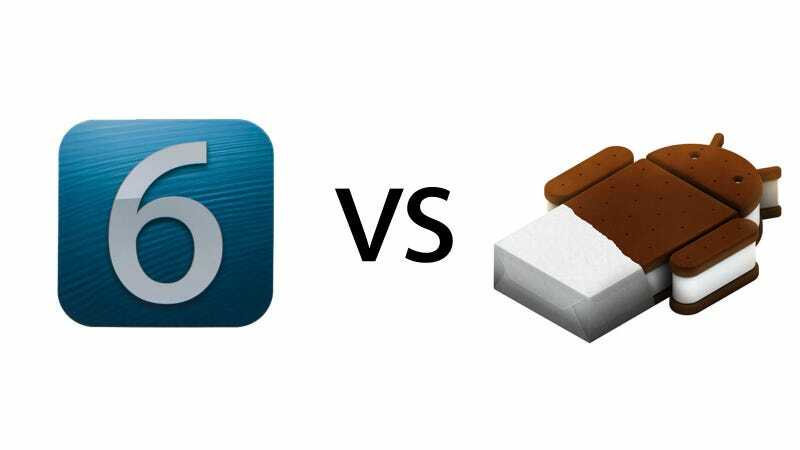 It's also been available on tablets with Ice Cream Sandwich, and there are rumors that it will be even more capable come the next version of Android. The new iOS 6 feature Passbook looks really, really cool. It aggregates all of your tickets, passes, and some of your payment cards into one mobile wallet type of solution. It has GPS deeply integrated so info pops up right when you need it (theoretically). It also live-updates, so if your flight is delayed or your gate is changed, it'll let you know. We have the feeling that this is just the beginning, and that we're likely to see NFC payments integrated at a later point, making it a true digital wallet. Android has Google Wallet, which some of its phones can use to pay at some places. Large, chain stores and taxis are the most common places right now. It's cool, but some carriers are really slowing down its growth by keeping it off their networks (looking at you, Verizon). Also, there just aren't that many places NFC is accepted yet. It can store a few loyalty cards (but not many). For more, you have to go to third party apps. Apple's Passbook just looks way better than what Google is offering right now. Has Facetime, which is cool for chatting with other people with Apple devices. It was limited to doing that over Wi-Fi, but with iOS 6, you'll finally be able to do it over cellular data networks. With Android, you can video chat with anybody who has Gmail, basically. It works on Macs or PCs, in whatever browser, and on Android phones and tablets. Basically, you have access to many more people. Also, you've been able to video chat over cellular data pretty much from the get go. iOS gussied up its phone a bit for iOS 6, adding a quick-reply by text feature ("Can't talk now, what's up?" etc) and a do-not-disturb mode to keep your phone from lighting up or ringing. You can also set it so calls will only come through from certain people. Both nice additions. Quick replies by text are built into Ice Cream Sandwich. You can pre-write a bunch of your most common responses and just hit one to send it. Android doesn't have an answer to Do Not Disturb mode, which would certainly be a welcome addition, though you can choose to have certain contacts go directly to voicemail when they call. iMessages were a disaster in the early developer previews of Mountain Lion, but it's looking like they're getting the bugs worked out. You will have a unified ID, so in theory your text messages will sync through your iPhone, iPad, and Mac computer. The ability to reply to text messages via a full-sized keyboard is wonderfully convenient. It also integrates pretty seamlessly with iChat. Being able to reply to text messages from my browser is one of the things I love most about using Google Voice. That said, most people just want to text from their own phone numbers, so iMessages wins out here. As far as IMs go, though, the cross-platform nature of Google Chat means you can simply keep up with way, way more people. One of the things we'd hoped for was that Apple would smarten up its app icons. Let them change to display information. Windows Phone does this with live tiles, and they're certainly more useful than static icons which simply launch an app. Unfortunately, Apple is still stuck in the past on this one. Widgets have been a part of Android for years now. Not only can they display information in real time, but you can use them to adjust settings on the fly without leaving your home screen. Some of them are even scrollable, saving you more space and looking rather cool. Yes, they come in all shapes and sizes so they don't look as tidy as Apple's square grid or even Window Phone's Live Tiles. But they're infinitely more useful.